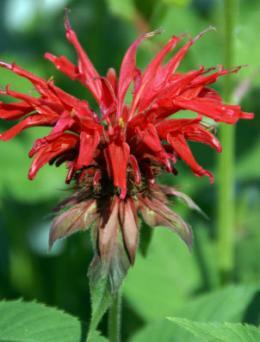 Bee Balm (Monarda) is a tall, perennial herb with nectar-rich, crimson red flowers. Hummingbirds, butterflies and bees all flock to the plant, as do gardeners who value it for its enormous flowers and use as a medicinal and culinary herb. Also known as bergamot or Oswego tea, bee balm grows from a perennial root system, erupting from the ground with lush growth each spring to reach from two to five feet tall, depending on the variety. The leaves are usually three to four inches in length. They are lance-shaped, but the real show is the deeply-saturated colors of the two to three inch diameter flowers which appear in midsummer. To the casual passerby, bee balm flowers might resemble dahlias, because of their many layers of tubular petals, but they are actually in the mint family. The leaves are fragrant and like many mints, it has underground runners that spread the plant. It is not nearly as invasive as peppermint, though it will slowly colonize areas of rich, moist soil. Plant bee balm in full sun or partial shade. The more sun it has the more prolific the flowering will be, though it is surprisingly tolerant of shade and appreciates a respite from the late afternoon heat in southern regions. Amending the soil with copious quantities of compost and watering frequently are the primary keys to lush, healthy growth with bee balm. 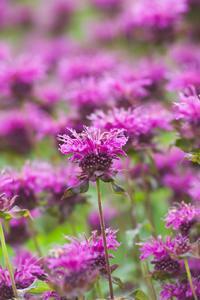 Bergamot is a natural fit for cottage gardens, perennial borders, butterfly gardens and habitat plantings. It is best in large spaces, unless one of the dwarf varieties is selected. It is a native North American species that is typically found growing at the edges of deciduous forests. Thus, naturalized plantings of large trees, native shrubs and wildflowers are one of the most elegant ways to use bee balm in the landscape. Once it is established, bee balm can survive periods of drought, but it enjoys almost as much water as you can give it, as long as the soil conditions are not boggy. It is a fairly tough and hardy plant, and does not require a lot of care, although some maintenance will keep the plants looking lush in your garden. Bee balm has one major weakness - it is highly susceptible to powdery mildew. It often survives with the disease, but the greyish cast on the leaves is unappealing and it does weaken the plant and reduce flowering. To control the problem you can use a commercial fungicide, but a better idea is to choose a variety that is resistant to the problem. Plants in full sun are less likely to suffer and good air circulation around the plants and watering at ground level to avoid wetting the leaves are also good preventative measures. Cutting back bee balm flowers after they have faded will help stimulate a second flush of smaller blossoms in late summer. After the first frost, the leaves will turn brown and the stalks can be cut back to the ground where the plant will remain dormant until the following year. This is also a good time to spread a layer of compost or mulch over the roots to add organic matter to the soil and improve its water-holding capacity. Every few years, it's a good idea to divide the dense mass of roots that forms in a successful patch of bee balm. Dig up gallon-size chunks of roots and soil in fall or spring and use them to establish the plant in other areas, if desired. 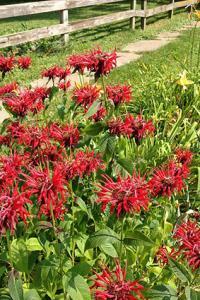 Other than watering regularly, there is no other maintenance required with bee balm. Bee balm has been bred for a variety of flower colors, growth habits and resistance to powdery mildew. Granite Pink is a dwarf form that stays less than a foot tall and bears pinkish flowers. Snow White is a white-flowered form that grows to three feet tall. Blue Stocking is a mildew-resistant variety with purplish flowers. Colrain Red is a deep red mildew-resistant strain that grows to four feet tall. For those that think native plants always have small and uninteresting flowers, bee balm will quickly dispel that notion. It is as bright and bold as any other popular border plant and will quickly earn a place in any gardener's heart.